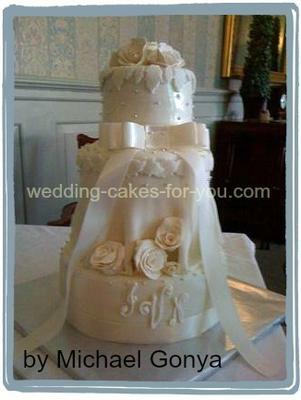 This page is a compilation of beautiful Wedding cakes from visitors. This was my first real wedding cake using real cake. It was a challenge stacking the cakes on top of a little one. (I used double cardboard). Lots of roses.. The drape in the middle cake was a plan B, because the buttercream was showing through the fondant.. lol I don't know why. The second tier was 8 inches tall. I put a few dowels in the bottom one then used 3 card board rounds for support in the top cake and dowels to made it looks like one cake. I had so much fun with my first real wedding cake. 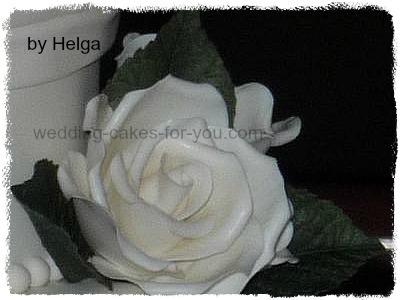 Beautiful Helga. Congratulations! I assume your other cakes were made using Styrofoam dummies. That is a great way to practice decorating. Good luck in the contest. This was my own wedding cake and my first. The cake was made at home and decorated at work. a prison. I teach NVQ catering but this was a real challenge, yet enjoyable and at times stressful. The hardest part was making the Lilies and getting them lined up to make the top look like it was resting on the flowers. 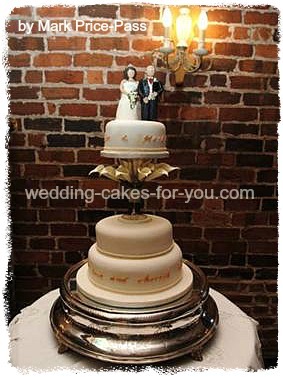 The wedding cake figurines on top were purchased and added for interest. Driving 20 miles with it in three parts back home was pretty nerve racking. Thank you for your cake contest entry. Great DIY wedding cake Mark. Congratulations! Hope you get lots of comments and ratings. 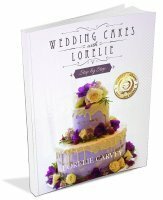 Ask your family and friends to stop by and say a few words about your own homemade wedding cake. Good Luck. First wedding cake I did for my neighbors sons wedding. The flavor was a Mexican chocolate cake with hot peppers and a chocolate butter cream. Michael all I can say is "You've got talent!!!" Mike made a 30 th anniversary cake for me and it was absolutely beautiful. He has a given talent for baking and decorating. 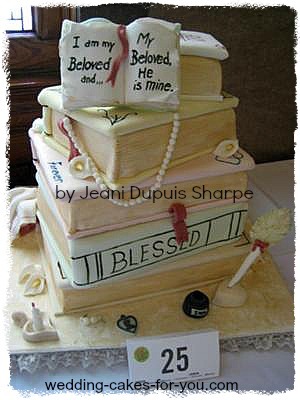 Wow...your 1st wedding cake. 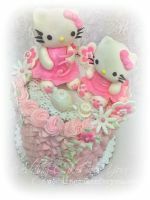 I'm fairly new to the cake decorating world, and it's people like you who have this kind of talent that made me want to try it out. Great cake!! Wow.wee wow wow wow!! 1st wedding cake?! You have SO much talent!! It's gorgeous! 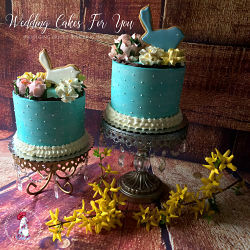 I hope its not your last...people deserve to have amazing cakes like this for their wedding! My little brother and his sweetheart he met in the Navy decided to have a 4th of July wedding. It was at my country home and they chose black and white for their colors. My sister in law had just lost her mother whose favorite flower was the daisy. I incorporated the daisies into their flowers which were black and white roses. This gave her a feeling of her mother's presence and a reminder of her mother. It was a beautiful day, nothing could have gone more right for the two of them. Her grandmother flew in to Kansas from Ohio and it was lovely! Thank you Edith for another great entry in to the cake decorating contest. Very sweet story too. 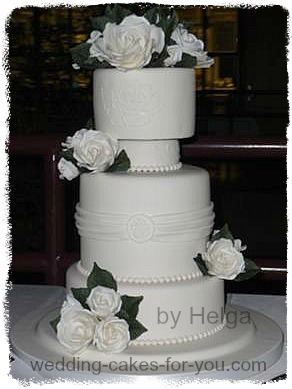 This tiered wedding cake was a great challenge for me. It was my second! Being that this was the first time doing this design and putting 4 cakes together, apart from doing the bride and groom toppers. The tiers had to be 4" tall because the bride wanted to have that look. It was scary to make such a cake. In the end it was all worth it! 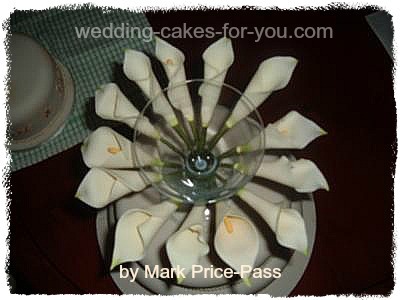 The great feed-back from the bride and groom is what makes all effort put into it appreciated. Wow, this is amazing! How can it possibly be only your second time?! Are you open to sharing your design techniques, I am a Gluten Free baker and designer in CT. Would love to do a design like this in the future! 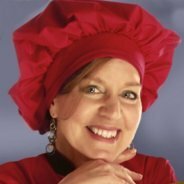 My e-mail address is dawn@wholefoodlady.com if you would like to share ideas. 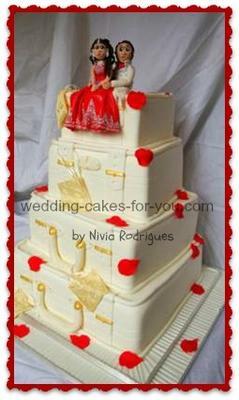 Hi Nivia, Thank you for entering your fabulous suitcase wedding cake. Its amazing that this is your second timr. The bride and groom toppers are awesome too. I can relate to how scary it is to make one so tall and heavy. Even after 25 years plus, I still get a little nervous. 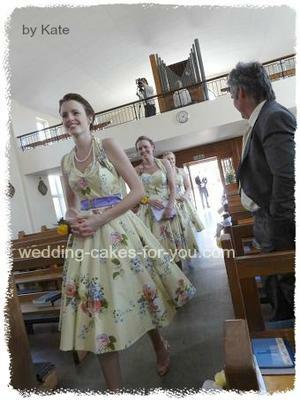 Until the cake is safely set up at the reception hall you really have to stay on your toes! Great work! Hope you get lots of responses . This cake is a beautiful wedding cake, my first ever. It took me several days to complete it, of course not working 24 hours a day. 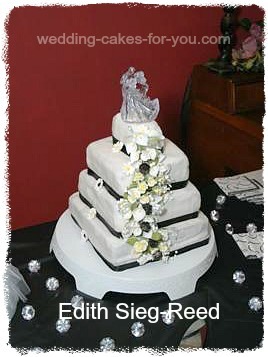 Thank you Rhonda for your beautiful wedding cake submission. Can you tell us more about it? Like what inspired you, tips or advice on decorating it. You must have learned something along the way that would be of interest to my readers. We would love to hear more. Thank you and Happy Baking and Decorating! Making Sugar Roses is HARD! 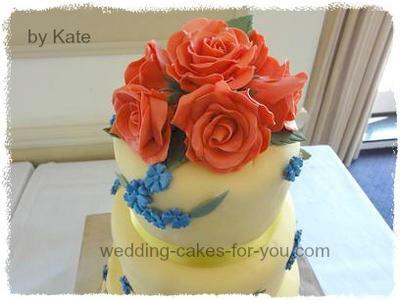 For the last couple of months I have been wedding cake and sugar-flower obsessed. 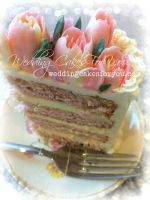 One of my good friends is getting married in a couple of weeks time and knowing just how much very average tasting wedding cakes can cost I offered to make her wedding cake as her wedding gift. She agreed. 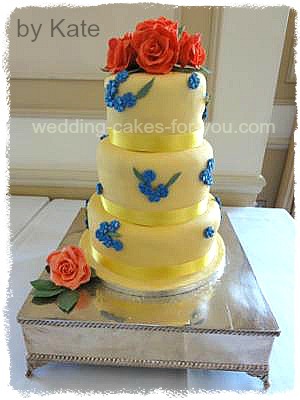 N wants a cake to match her bridesmaid's dresses; beautiful vintage style yellow background with pink roses and blue forget me not flowers. 'Sure!' I said. 'No problem!' 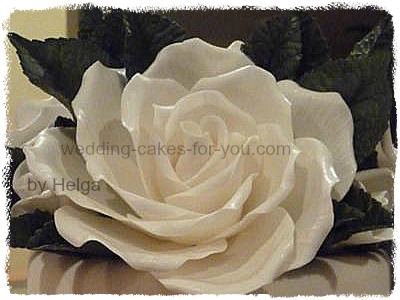 And then proceeded to realize just how incredibly difficult it is to make a sugar rose! 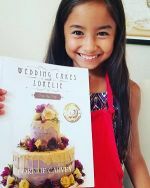 Thank you for entering my wedding cake decorating contest! Your cake is beautiful and your roses are amazing. All of your HARD work payed off. 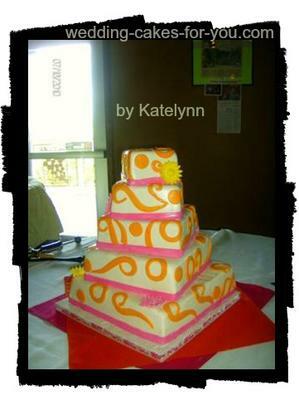 This was a wedding cake I did recently...the couple gave me their western wedding cake topper and their color scheme. The only real instructions were to keep it fairly simple. 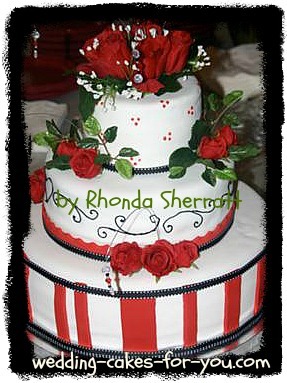 So I chose rope and pearls as the borders and used roses to bring in a pop of red. Each tier was a different flavor with three different fillings. It was also accompanied by three dozen cupcakes in three different flavors. 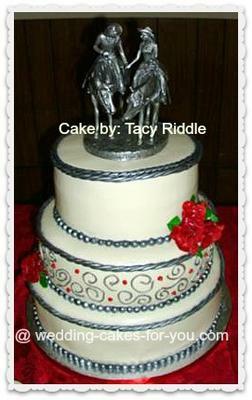 Tracy Thank you for your western wedding cake entry. If you would like to tell us more please feel free to add to your story in the comments below. Would love to get more information such as what the flavors were. Do you have a tip you would like to share? Thanks the more details the better :-) The topper is great. Can you find out where it came from? I know that someone is going to come along and ask that of me where they can find it. not a cowboy-theme fan but this is very nice! great work! This Ivory Buttercream Cake was 4 tiers of actual cake. Each tier was a different flavor. 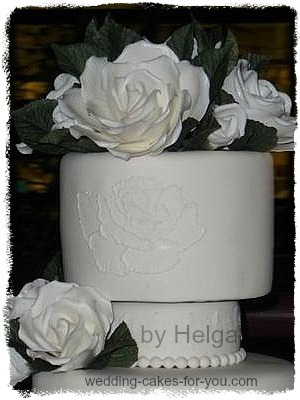 It is covered in ivory buttercream, black satin ribbon and fresh flowers. The bottom tier was made using a diamond impression mat and then placing sugar beads at each cross point. 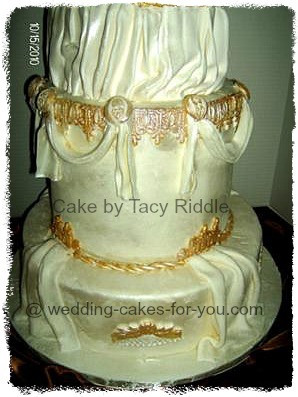 The next tier up is hand piped swirls and such using buttercream. Next we did the sugar beads in a diamond pattern. 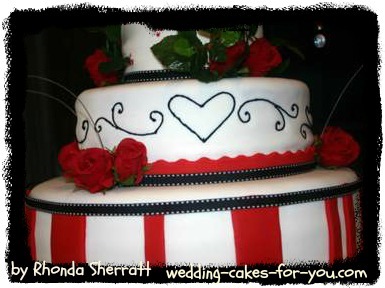 The top tier is buttercream piped in the shape of a plaque with the letter "B" in the middle for their last name. This was the first wedding cake I have ever made and also the largest. I have to say thanks to my mom who came over at midnight and stayed until 4 am to help me finish. where did u find the fresh flowers? i need to make a wedding cake and want to use fresh flowers. Did u use organic or regular flowers? The cake is totally awesome!!!!! Wow Amazing wedding cake. It's hard to believe it's your first one. Thank goodness for mom's like yours who will stay up until 4:00 am to help out. The bride and groom must have been very pleased. Good luck. The winner will be announced after October 15th. This Ivory Stencil Wedding Cake was intended to sit atop a cupcake stand, but because of the weight it got a place all of it's own. 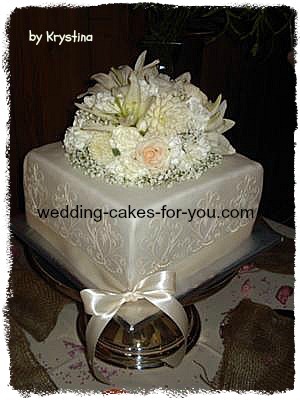 It is covered in white fondant with a royal icing ivory stencil on all four sides. The flowers are real and so is the satin ribbon around the bottom. I can see that you really enjoy doing very detailed cake decorating. This little fondant design is exquisite. 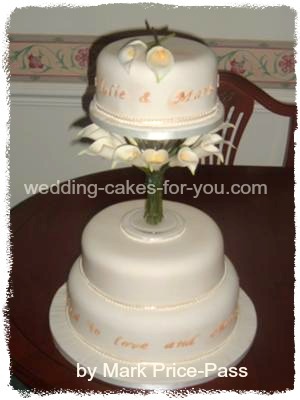 Thank you for entering this and your full size 4 tiered Ivory Buttercream Wedding Cake. Keep em coming. They are very inspiring to see. 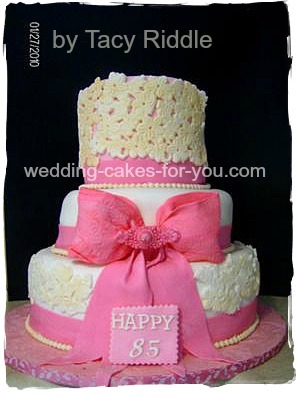 This fondant bow and lace cake I made for a ladies 85th birthday is a 3 tier cake (pink is her favorite color). In doing all of the lace I learned that it is very tedious, I had to punch out all the holes by hand. Beautiful cake! There looks like there's detailing on the pink bow...is there? Either way that bow is gorgeous! Thanks for entering the cake decorating contest. It's a beautiful cake. The birthday girl must have been very happy with it. I can imagine that the lace was tedious. Can you give us some details as to how you made the lace and the bow? This was a funky wedding cake I made for one of my friends. She wanted fun bright colors, and funky patterns. So this is what I came up with. One of the hardest things about it was making sure I had the correct size pans, because when I turned each tier they would hang over if they were not the right size. How did you fair in the competition? I can see how much work you put into this. It is a 'novel' (ok, excuse the pun), and with a lovely romantic theme. I like all the accessories around it, too. Nice touches. Thanks for submitting your unique design. I wonder if you could tell us more about how you did it. Any special techniques? Do you have a piece of advice that my readers could benefit from? Thanks and good luck. Let your friends and family know so they can comment and rate. I made this Grecian Inspired cake for a local vendor fair, I had one that was funky but I wanted to show something more sophisticated! So I used an old prom dress as inspiration and this is what I came up with! The hardest part was getting the swags to stay in place, every time I turned my back another one had fallen off, so eventually I called some help to just sit and hold them until they dried! 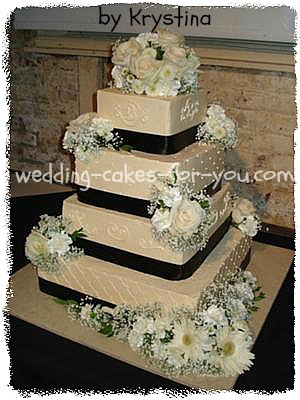 Very beautiful and unique wedding cake design. I love the swags and the gold details. Thanks for joining the competition. Let your friends and family know that they can come and comment on your cake.